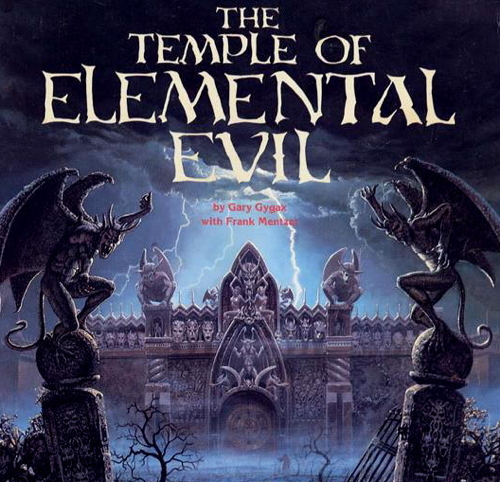 Greetings Greyhawk fans! It's a slow week so I'm here to tell you a bit about my home campaign. 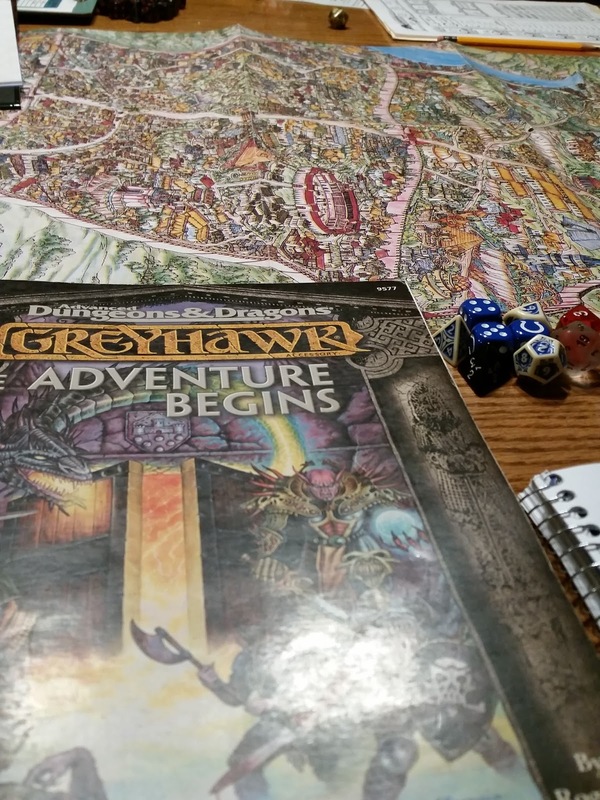 We recently wrapped up playing the first two modules in Tales From the (Green Dragon) Yawning Portal, and have now returned to the City of Greyhawk to indulge in some old school down time activities and urban intrigue. 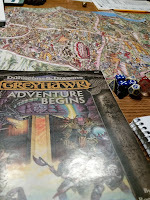 I am using the City of Greyhawk boxed set, Greyhawk the Adventure Begins and the updated city map by Denis Tetreault which you can find here. So far our two dwarven cousins Marya Hammerfist and Korgan Crag have made connections in the Greyhawk dwarven community (including tax collector Glodreddi Bakanin's crew) and got a job defending the Silver Garter from preachy Pholtus priests. Tiefling fighter Bravos has reconnected with his mother in the Artisan Quarter (a first for me) and confronted the Pholtans on their own turf. Halfling rogue Minchy and tiefling warlock Everleigh Strongbow have made their presence known at the Thieves' Guild Hall and Everleigh is using Bravos' mother as day care for her adopted goblin baby. All this before, the group is invited by a con artist to a neighborhood called Odd Alley in the Old City for an important counter-offer away from the Silver Garter. Odd Alley is well, weird. Time runs differently there and the shops are more exotic than elsewhere in the city. Based on a location in one of Gygax's novels, I may do a write-up on this area someday. At the end of the alley in an abandoned building they fought a "door" mimic. So far so good, eh? It's been a long time since I've ran Greyhawk urban sessions (recent years focused on the Sea Princes). I used to do this sort of stuff almost exclusively. Urban adventures are a slow build up, as hooks and subplots are created almost randomly through roleplay and actions taken by my players. It's how sandbox games should done, and the city is the only place I've felt comfortable running one. 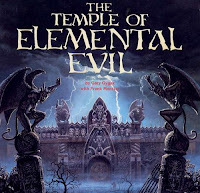 I'm not sure how long I'll be running them around the streets of Greyhawk, but when I'm ready I am eyeing White Plume Mountain as their next big venture. Wish them luck! One last, very important news tidbit. Do you like video games? Have you ever tried watching live-streams of video games? Okay, well there is no one I know more fun to watch than my good friend, the multi-talented, awkwardly regal, xb0shi3x. 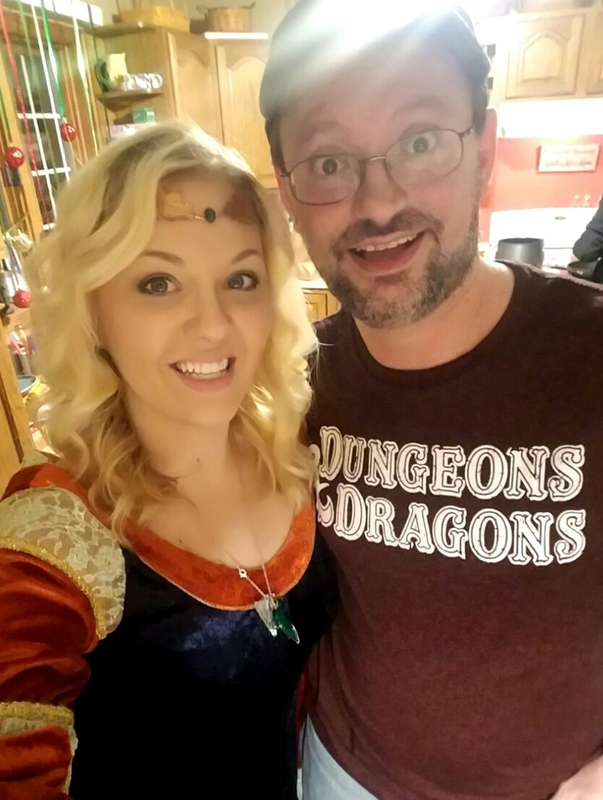 I mean, who else regularly cosplays for her D&D sessions? Check out her stream on Twitch twice a week, and subscribe, you'll be glad you did! Welcome home fans of Greyhawk. Today I'm musing over my latest front page poll, Which Northern Barbarians Would You Play? This poll was open to multiple voting since there is so many choices and some are similar. While the north is very full of barbarians cultures, please note the Flanaess also has barbarians in in the middle (Bright Desert) and in the south (Amedio/Hepmonaland). At any rate, let's see what makes these barbarians special for your player characters. Topping the list barely at 26% of voters is the Frost Barbarians (Fruztii). Kin of the Snow and Ice, the Fruztii speak the Cold Tongue (Fruz) and live on the Thillonrian Peninsula, or as the barbarians call it, Rhizia. Frost barbarians are allies to the land of Ratik in addition to the dwarves and gnomes of the mountains. Frost barbarians hate the Great Kingdom, Iuz, Stonehold the Sea Barons and especially Bone March. Normally content to raid the coasts by ship, many years ago the Fruztii led raids with their Suel kin into Bone March and were soundly defeated. Taking most of the losses the Frost were diminished, now deferring to the Snow somewhat in politics. Why choose a Frost Barbarian? 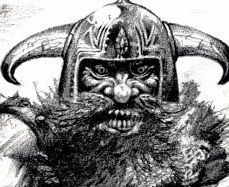 The Fruztii are the most typical of your northern "vikingesque" barbarians in the World of Greyhawk. Fruztii is closer and borders more nations than any other putting your character within easy travel distance of home. There is no shortage of enemies for your barbarian and the familiarity with demihumans is a plus when putting your fellowship together. Next at 25% of voters is the Rovers of the Barrens and the Wolf Nomads. These two are a synergistic pair because of their history of conflict. The Rovers, a Flannae tribe, lived on the bleak northern prairies for centuries before the Twin Cataclysms brought Suel, Oerid east, but only the Baklunish-Oerid Wolf Nomads challenged the horse-riding Rovers for the north. The Wolf Nomads (Wegwuir) migrated around the Yatils along with their Tiger cousins to the north steppes. Only the presence of the Rovers halted the advance of the Relentless Horde. The Wegwuir are also powerful hunting horse riders and they skirmished with the Rovers for decades yet the arrival of Iuz put a wedge between these barbarians giving them a common enemy. By then however the Rovers had been diminished and isolated as a population, while the Wegwuir were also contained despite a victory versus Iuz at the Battle of Blackwater Bend. Why Choose a Rover of the Barren? This type of barbarian would defeinitely be in tune with nature and survival in the wilderness. In fact, the Rovers are also known as Wardogs. In some publications, these hunters have an Great Plains American Indian feel. Rovers would not only be good barbarian class members, but given their Flan heritage, good druids and rangers as well. Why Choose a Wolf Nomad? These are your Mongol horsemen analogs. If you are looking for a character skilled in mounted combat and archery, you can't go wrong with the Wegwuir. Their hatred of Iuz is probably equal to that of Furyondy and the elves of Vesve Forest as well giving your character a good reason to travel beyond the steppes. Following closely on the heels (or hooves) of the Wolf Nomads at 23% is the Tiger Nomads (Chakyik). Cousins of the Wegwuir, they were once one big Relentless Horde until their ruler died and the two tribes split, with the Tiger ending up cornered in the northwest between the Wolf and the civilized lands of Ekbir. The Chakyik like the Wolf have their own Baklunish dialect (Ordai) and are renowned horsemen. The Chakyik are friends of no nation, even Iuz who once proposed an alliance. For now the Tiger Nomads live in relative stability, either trading with (or raiding) barbarians and civilized people alike. Why Choose a Tiger Nomad? Culturally you'll be the same as a Wolf Nomad except their thematic totem animals. Chakyik have more animosity to the Baklunish than Iuz given their proximity. Also as a strange twist, the ruler of the Tiger dabbles in illusion magic, so a wizard/sorcerer from the Tiger Nomads isn't out of bounds. One more tidbit, the Chakyik are supposedly the most accomplished archers in the north if that is your character's focus. Tied at 13% of voting is the Snow Barbarians (Schnai) and the Stonefist barbarians of Stonehold. The Schnai are arguably the strongest of the three Suel barbarian clans, living on the fjords of Rhizia and the highlands of the Corusk Mountains. The Schnai are the most capable seafarers, known for exploring and their martial prowess. Snow barbarians have few friends, but they have plenty of enemies, such as the Great Kingdom whom they raid, or at sea with the rival Sea Barons, the Stonefists to the west, and inland they themselves have to contend with giants. Schnai heroes are known for their funeral pyre at sea custom. Meanwhile, Stonehold is home to barbarians of a different sort. These fierce nomads hunt, herd and live on the tundra or in forest villages. Formerly ruled by the Coltens Feodality, a bandit ruler nicknamed Stonefist was banished here and soon attracted other evil bandits and barbarians to his side then wrested control of the lands from the local nomads. The Fists are the best of the hold's warriors, gaining higher position through the annual Rite of Battle Fitness. For a time Stonehold allied with Iuz and thus because of their invasions are not liked in any neighboring land. Why Choose a Snow Barbarian? If you want to build an imposing, noble, axe or swordsman this is a good choice for homeland. As mentioned above, you'll also be able to have a background in seafaring. Schnai know the cold tongue like their kin, but could also learn giant as an extra language. Snow barbarians don't lack for enemies and given their range in explorations, can be found anywhere in the Flanaess. Why Choose a Stoneholder? If you want to play a barbarian with an evil tilt then perhaps a Fist is your character. Some Stoneholders also know the cold tongue but have Flannae blood well. Given their ferocity in combat barbarian class is a prime choice. Stoneholders live in harsh terrain so might your character would want good survival and nature skills. Adventuring groups however, should be wary of having a Stoneholder barbarian in their mix, though they will have revenge in mind versus Iuz. Lastly at 9% is the underrated Ice Barbarians (Cruskii). The Cruskii or Ice Clan, are the most brave of the three clans. They live among the tundra of the northernmost part of Rhizia and are also capable seafarers on the Icy Sea or the Solnor Ocean. Though less numerous as a people, the Cruskii take part in many raids with their kin making enemies of places like the Great Kingdom who couldn't find these barbarians on a map. Cruskii are pure Suel and because of this, were at one time entreated by the Scarlet Brotherhood for an alliance. Why Choose an Ice Barbarian? If you want a viking-like barbarian from a very remote homeland, this is your choice. Ice babarians make good berserkers having to fight both Fists and giants often. Their survival and seafaring skills cannot be stated enough. Ice barbarians have few friends, but in a group of northerner characters they can be perhaps the most loyal. That's all for now. See you after the next poll! Hey Greyhawk fanatics! Today was a special day because I was the FIRST guest on a new live stream talk show about all things Greyhawk called Tales From the Green Dragon, hosted by DM Shane of Return to Greyhawk. We covered a lot of topics (including the Green Dragon Inn) and interacted with our live viewers on Twitch. I had a good time and look forward to next week's installment. For those who missed out, you can see the replay HERE. Labels: 1st edition, 2nd edition, 3.5 edition, 5th edition, artists, authors, canonfire, dragon magazine, Greyhawk, Gygax, maps, mortellan, Paizo, ReturntoGreyhawk, TalesFromGreenDragon. Creatures of the Bright Desert, vampire cacti evolved their blod-draining abilities to help meet their water needs....Migrating birds seem to have carried the seeds of vampire cacti to the margins of the Dry Steppes, and even to the forbidding Sea of Dust...."
Bonus: In the Greyhawk Adventures: Monstrous Compendium supplement, vampire cacti are found on the "temperate desert" random encounter chart (same chance as a blue dragon or pyro-hydra). Vampire cacti are not however, found on the "tropical desert" chart. Torm is the leader of the Circle, having taken that role several years ago when their paladin departed to team up with some paladins of Mayaheine on a quest to reclaim the Shield Lands." Bonus: In the same module, Torm (no relation to the namesake Faerun deity) is a priest of Pelor god of the sun. The Circle also includes two thieves, a ranger, and an enchanter. There is another adventuring party called the Dark Star Guardians, who are also undercover in Pest's Crossing trying to dislodge the giants. The city may also serve as an entrance to or exit from the Underdark, for many of the city's palaces and castles featured deep dungeons...."
Bonus: For an ancient city, Utaa must've been the biggest city in the history of the Oerik if not Oerth. I highly doubt any other city in the Flanaess takes up 1/3 of a map hex. For comparison ruins of ancient middle eastern cities like Ur and Babylon only cover 3-4 square miles; their actual pre-ruin area thus is doubtfully as big as Utaa. For further reference, modern cities are ginormous, like New York (5400 sq. mi. metro) and Tokyo (4300 sq. mi.) Present day Rome is only about 500 sq. miles however, so it stands to reason Utaa was at least on par with one of the greatest ancient cities in our history. Scimitar +1 'Schakha'...AL LN, Int 14...speaks azer, giant, common, human common (?) and dwarf..."
Bonus: (spoiler) The same module has several other more powerful sentient/aligned swords that are non-random. Good luck finding them, yet your chances of locating those are better than the 1 in 100 chance of stumbling onto one of the two blades above. Side note, a weapon that speaks azer is pretty damn rare (they are an elemental fire race first seen in the MM2) and useful in this module. 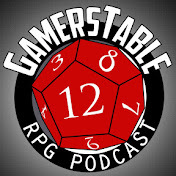 Plus, I'm rusty on AD&D, what is human common versus regular common? That's all for this installment. Happy exploring! "Their greatest kings and jarls have all been seafarers, beginning with Schoffmund the Strong, who defeated the Kraken of Grendep Bay. 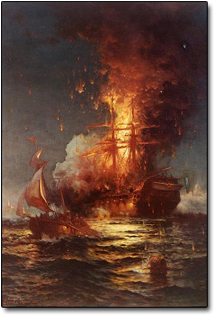 Since this day, all dead Schnai kings are interred in ships, which are ignited and set adrift on the sea." Bonus: In the hardback Greyhawk Adventures is a wondrous item called the Black Sails of the Schnai. A great warrior who is burned on his funeral pyre can be summoned back to fight as an einheriar for the possessor of the last magical shred of his ship's sail. "The stables now hold over 100 breeding mares, some two dozen stallions, and perhaps 200 fillies and colts in various levels of training. The purchase price for one of the young horses is double the asking price in the High Market of Greyhawk, but generally considered worth it. For those who take their horses very seriously, the Blackfairs may consider parting with a breeding mare, for 2000-3000 gold, approximately. Some of the stallions can be had for as little as 10,000 gp, while others have fetched five times that amount. The stud of the herd, called simply Father Black, is not for sale, though it is rumored that the lord has been offered more than 100,000 gold for that horse." Bonus: In case you haven't done the math, all the horses of Blackfair Manor are worth a total of 570,000 gold pieces. Minimum. Remember that tidbit when you have too much treasure to spend and want to show off to your comrades, or when your DM asks your group if you want to go looking for scraps of treasure in some nearby dungeon and instead turn to a life of horse thievery. "The solitary tree is surrounded by an open field 100 yards across. The Lone Deklo is a monstrous example of its kind, 30 feet in diameter and nearly 300 feet tall...The Lone Deklo is sentient and is effectively a sage specialized in flora, fauna and astronomical and meteorological phenomena. It can converse in a low whisper similar to the sound of wind though branches..."
Bonus: For comparison, in A Guide to the World of Greyhawk, the section on Trees (yes, Gygax created his own trees) states that a deklo tree is a massive hardwood often 15 feet in diameter and over 100 feet tall with round leaves than can sometimes span a foot in diameter. For further comparison, the world's tallest tree on Earth is Hyperion, a sequoia at 379 feet. Sequoias have an average width of 24 feet and can live roughly 3000 years. If the Lone Deklo is half that age, it was around before the Twin Cataclysms, the Migrations and might remember the time of the elves and the ancient Flannae kingdoms. A brief siege of the city by refugee goblins and orcs in 506 CY, at the height of the Hateful Wars, and some unsuccessful attacks by the Sea Princes sailing up the Kewl...are distant history to the human citizens of Jurnre, and even nonhumans have begun to forget. Not even the oldest gnome can remember the sight of enemies within the gates." Bonus: Not only is Jurnre peaceful, it is quite idyllic. The County of Ulek is ruled by Archdruid Lewenn (13th level) who is quite possibly the only druid involved in Flanaess politics. His constituents are of course halflings, gnomes, sylvan elves and also the nearby Silverwood is home to treants and unicorns. That's all for now, hope you enjoyed!